Wednesday, Apr. 17, 2019, 12:30 – 1:20 p.m.
Join us Wednesday, April 17th, 2019 in JOY 215 for a lunch-talk by Dr. Katherine Beckett. "Race, Equity and Justice: The Role of Social Science Evidence in Criminal Justice Reform Efforts. Social scientific evidence regarding racial and ethnic disparities and their causes is often central to efforts to challenge unconstitutional practices and unhelpful policies in the area of criminal justice. 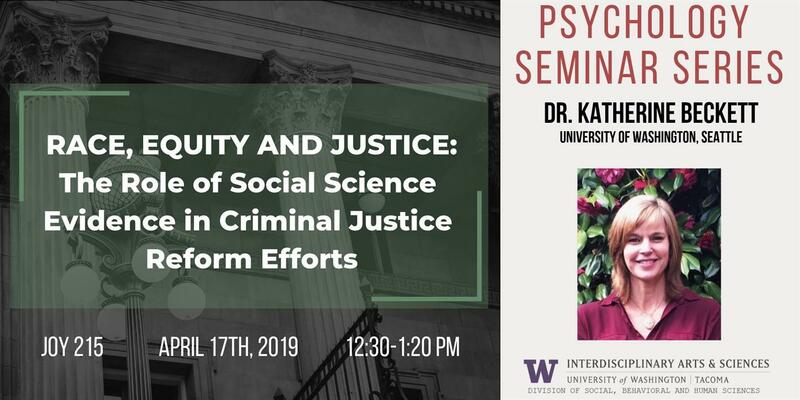 In this talk, Professor Katherine Beckett will describe a number of partnership-based research projects that involved analyzing social scientific evidence in order to challenge disparate and counter-productive policies."